Two years ago Minnesota appeared to be one of the brightest young teams in the NBA. But as frustrations bubbled and rumors swirled, the narrative around the Timberwolves took a genuinely shocking turn. In April 2016, when the Wolves hired Tom Thibodeau, Minnesota had the brightest future of any young team in the NBA. There were two former No. 1 picks who looked like franchise cornerstones, Zach LaVine was an intriguing young combo guard, Ricky Rubio was a holdover as the steadying veteran presence, and there was also a lottery pick that would eventually become No. 5 overall in the 2016 Draft. And there was Thibodeau, the most sought-after coach on the market, headed to Minnesota to take all that potential and turn it into something real. Given what the future looked like at that point, the intervening two-and-a-half years have been genuinely shocking. It's not just that the internet's Wolves dreams haven't come true, but what's happened instead has been so much darker than even the biggest Thibs skeptics could have imagined. 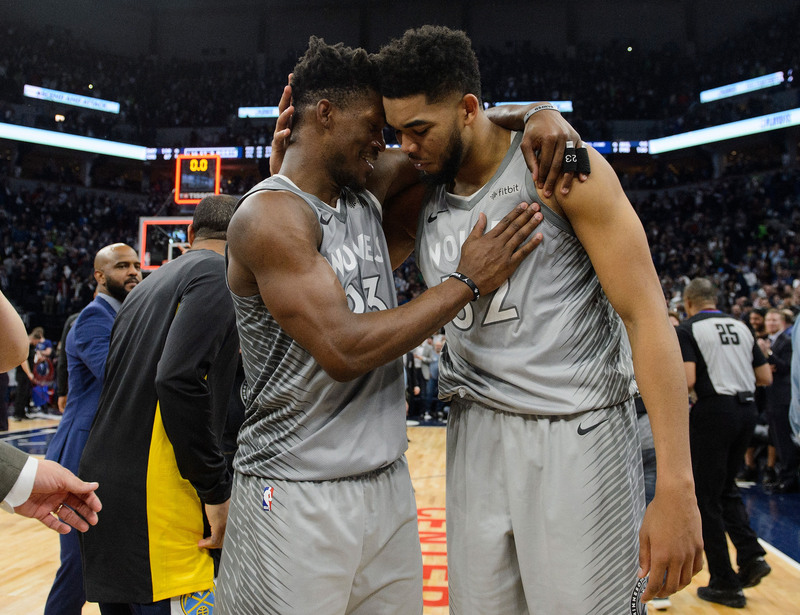 As of this week, everyone sounds frustrated, the team appears to be fracturing, and after most of the Wolves angst was confined to whispers for the past six months, we might be nearing a tipping point. On Saturday, The Athletic's Jon Krazyznski reported that Jimmy Butler would meet Monday with Tom Thibodeau to discuss his future with the team. Then, on the eve of the rumored Thibs-Jimmy summit, Stadium's Shams Charania said that Towns won't sign any contract extension in Minnesota "until the Jimmy Butler situation resolves itself." As for Butler, this tweet Monday night was pretty funny. Also, not a denial! This weekend's news wasn't the first sign of discontent in Minnesota. Back in May, Thibodeau fired several Wolves staffers, including an assistant coach (Vince LeGarza) who had worked closely with Towns through the big man's first three seasons. Then, midway through the summer, when Towns was asked about his long-term commitment to the Minneapolis community, his answer was brief: "I think I've done a lot of things here. I'm very proud of the things I've been able to do so far. I've had a lot of things that need to be talked about, so I'll move on." All of this echoes conversations around the league over the past few months. Anytime the Wolves were brought up, there were always these vague allusions to internal friction that couldn't really be explained. Just last week, on a podcast with Bleacher Report's Howard Beck, 38 year-old Jamal Crawford explained why he walked away from a $4.5 million option that would've allowed him to return to Minnesota this year. "For me," he said, "it just wasn’t a happy environment. It just wasn’t happy." Losing a player like Crawford—or adding Luol Deng as a 15th man and continuing a surreal attempt to reassemble the nucleus from the 2011 Bulls—is not the end of the world. But losing Towns sort of would be, and at least for the the moment, that's not entirely out of the question. While we wait for resolution on several fronts, I have two thoughts on the tea leaves we've seen thus far: 1. All of this sounds like an incredible mess. 2. This is a mess that reflects poorly on everyone involved. A few years ago Towns looked like the NBA's next great superstar. Remember when people were convinced that he was a safer bet than Anthony Davis? That feels like it happened in a different decade. Two years later, it's abundantly clear that KAT's defense isn't where it needs to be. If anything, there are nights when it looks like he's worse than he was as a rookie. Towns remains brilliant as a scorer, but even on that front, he was weirdly deferential in the playoffs, and it's not clear he makes his teammates better. There have been questions about his maturity, and now, with Butler rumors swirling, Towns might be pressuring the team to give away the best teammate he'll ever have in Minnesota. All of these are red flags. Thibs could be forgiven for some of his management blindspots if his actual coaching were solidifying the foundation the way it was supposed to. That hasn't happened. The team succeeded last year thanks largely to masterful performances from Butler, but younger players plateaued in some key respects. Namely, if Towns can't get the ball in playoff games and looks hopeless on defense, that's a reflection of the coach's failures as much as the player's. And Butler. He works so hard that his contributions are generally beyond reproach, but maybe they shouldn’t be. He is a flat-out maniac who's wonderful to watch as a fan, but it's pretty clear he'd be exhausting to deal with on a daily basis. On the court and beyond, he hasn't shown the ability to adapt to young teammates and find ways to empower them. Lack of growth from young stars isn't strictly a Towns and Andrew Wiggins problem, or even a Thibodeau problem. In the same way that Russell Westbrook’s domineering personality is the best thing about him and also a challenge for everyone around him, Butler’s grinding approach forces his teammates to either fight him for control or be marginalized while he takes over the end of games. Butler has been great enough to make that deal worthwhile, but as his body breaks down with age and his contract gets expensive after his free agency next summer, the bargain is going to get more complicated. Anyone paying attention to the Minnesota offseason can see that it already has. This is how things look in Minnesota as of September 2018. KAT’s frustration with Butler seems reasonable, but so does Butler’s frustration with KAT, and if either of them is frustrated with Thibs, that makes sense too. Everyone deserves blame. I didn't have the heart for a Wiggins autopsy, but he's part of the story as well. Even the media itself could bear some responsibility. In retrospect, it may not have been a great idea to start talking about this team like a budding dynasty before anyone had ever made an All-Star Game. The situation isn't hopeless yet, and if this reads like a eulogy, that isn't the intent. Butler could still decide to stay in Minnesota this year and beyond. Towns could re-sign. Wiggins could make progress. This can work. For now, all we have is a meeting to "have honest conversations about the All-Star's future with the team." Winning could solve every problem in due time. But if anyone is really having an honest conversation about the future of the Wolves this week, it sure sounds like there are a lot of problems to solve.